Here’s a scary stat: Email marketing lists decrease 22.5 percent every year. That means almost a quarter of your list – your list of valued email subscribers – will no longer be engaged or on your list at all. Fortunately, that doesn’t mean all of those subscribers are a lost cause. With a re-engagement (or win-back) campaign, you can send targeted messages to rebuild those valuable subscriber relationships. We’ve written in the past about the positive benefits that come along with maintaining a healthy email list and removing inactive subscribers. Today, we’re going to cover exactly what to write in a re-engagement email. Just as you worked hard to build your subscriber list, you’ll also have to work hard to maintain that relationship. And for those who have drifted away, you’ll have to put in work towards winning them back. In a recent study by ReturnPath, 14 percent of subscribers who received win-back emails read them. (That percentage even increased to 45 percent for subsequent messages too.) Although this may not appear significant, it’s a positive step when you consider these folks weren’t engaged with your emails in the first place. If the goal of your re-engagement campaign is to get people interested in your emails again, it’s important to consider every aspect of an email: the content, the call-to-action and the subject line. To help frame the conversation, think about how this email can remind subscribers of the value of your emails. What did my subscribers sign up to receive originally? Am I continuing to send them content based on their original expectations? Did I change anything in my email strategy that might have caused them to stop engaging with my content? What can I offer to pique their interest again? Once you have those answers in mind, it’s time to start building your message. If you find that you’ve started sending different content, you may need to share content that aligns with their expectations. Unless you’ve purposely changed your email content strategy and want to target different subscribers, increasing the frequency of content they previously engaged with could be a good place to start. If your inactive subscribers haven’t read your emails in a while, they might have also missed important updates or products you’ve released. Getting them up to speed might get them re-interested in your content. Notice how we remind them of the value our weekly newsletter. And we made sure to position it as though they would miss out on something if they didn’t stay. Offering an incentive like a whitepaper or coupon code might also help you re-engage subscribers. If you hooked them onto your list with a piece of content in the past, consider how you might be able to repeat that success during your re-engagement campaign. Offering a special discount, for example, is a great way to get subscribers interested in your emails again. Not only are you giving your subscribers something in exchange for their time and attention, you may even get another sale out of it as well. To help you learn more about why subscribers grew disinterested in your content, asking them for specific feedback could help fill in the gaps. Was there something you could have done better for these subscribers? What made them stop engaging in the first place? If you make a subscriber feel like their opinion is truly valued, they may want to stick around. Plus, this will give you valuable insight into their needs that you wouldn’t get anywhere else. As you get feedback and notice common themes, you can use that to implement in the future. The goal is to inspire subscribers to engage with your emails and take an action, so make sure it’s bold and clear. To increase clicks, I encourage you to limit yourself to one call-to-action. Too many CTAs can be overwhelming, decreasing the chances that your subscribers will engage at all. Whether you ask them to stay on your list, learn more about a product or service, or download an incentive, make sure it’s easy for them to do so. What works in this email’s favor is the single, visually-compelling and clear call-to-action. Not many CTAs look like an actual button, which makes this a fun element for subscribers to engage with. For re-engagement emails, we find the best subject lines are ones that specifically reference the goal: to win back your subscribers! Both subject lines work well, but grab the reader’s attention in different ways: A simple “We miss you!” lets the subscriber know that they appreciate their readership and feels more conversational. On the flipside, “Do you still want updates from us?” is direct and inquisitive. It tells the subscriber that they care about their time and want to make sure they get something out of the relationship. I encourage you to review your past emails to see what’s working for your specific audience. Look for common themes like subject line length and tone – these are elements you’ll want to try to replicate. Since these details depend on what your audience responds to, I encourage you to test different variations and find that sweet spot. All email lists are different, so what work best in one situation may not work so well in another. One message might do the trick, but you could be more effective by sending two or three emails to warm people up and get them re-activated. Since these subscribers are already less engaged, aim to keep your campaign short. Send an email, wait a few days and see who’s interacted with your content. If they’ve clicked through to your content or stated they want to remain on your email list, then great! They can stay on your list and get enriched from your content. What if they didn’t open the message? You’ve taken the time to craft your re-engagement emails, but there are subscribers who haven’t responded at all. In this case, it’s time to say goodbye. You’ve done what you can to win them back, but if they don’t want to receive your emails, it’s better to let them go. Not only will they appreciate a cleaner inbox, but it’ll also help boost your email reputation and deliverability – which can actually help improve your email performance in the long run. Re-engaging inactive subscribers can help win back parts of your list that were no longer active. With actionable language and focussed messaging you’ll be able to re-energize an old list, and connect with your subscribers on a more personal level. We know that sometimes, it can be really hard to write your emails. 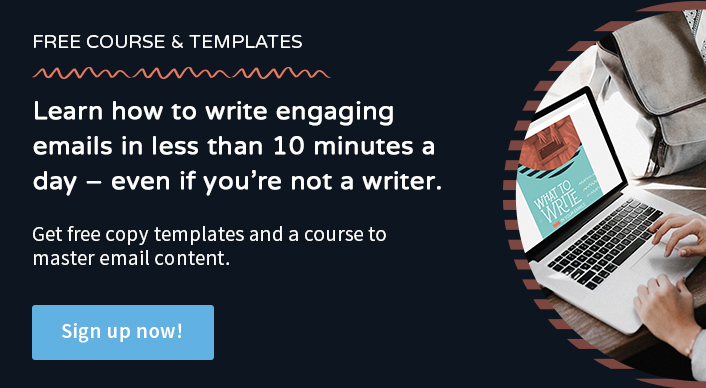 That’s why we created our What to Write in Your Emails guide and course, complete with 45+ email templates! Learn to nurture relationships with your readers and create loyal customers. How do you plan on running a re-engagement campaign of your own? Leave a comment below to share all about it! How do I know who my inactive subscribers are? Thanks for reading! If you want to find your inactive subscribers I’ll provide some additional content to help clarify the process. Just keep in mind that the time period you search for will depend on your past sending history. I typically suggest you start with 3 to 6 months of inactivity and go from there.